What is it about an 81-year-old man that captivates youths from around the world, gathers hundreds of thousands of people along the streets upon his arrival and who can bring a crowd of a half million people to complete silence? The Holy Spirit at work. The event begun by his predecessor, the late Pope John Paul II, aims to gather together the world’s youth on an international level every two to three years. Jessica Chamblee, a young adult from St. Agnes Parish in Nashville and a senior at Franciscan University of Steubenville, Ohio, considers the Holy Father to be the most popular person in the world. It is in his profound challenges that the pope finds so many young people who love him, said Trina Trusty, a young adult member of St. Lawrence Parish in Indianapolis who attended World Youth Day for the fourth time. “Even though he doesn’t get up and entertain us, we’re all seeking the truth and he’s providing it with love,” Trusty said. Archdiocesan pilgrims, like many from around the world, were able to recognize the ways that the Holy Spirit had led them to this large gathering, and watched as the Spirit guided the days’ activities. Chamblee said the Holy Spirit was the reason she went on the pilgrimage. Just weeks ago, she was not planning on attending World Youth Day, but three weeks before its start, a person backed out and everything fell into place. She already had a passport and was able to raise all the funds needed within two weeks’ time. Like Chamblee, Brendon Young, a member of St. Mary Parish in Mitchell and a senior at Mitchell High School, recognized the Holy Spirit’s role in his participation in the pilgrimage. He originally just wanted to see what Australia had to offer, but his focus changed radically as the trip progressed. “I’ve thought my life through more and I really want to become a saint now,” Brendon said. The large and enthusiastic crowd of international guests also left their mark on the city of Sydney. The streets of the harbor city were filled with large groups chanting, singing, waving their flags and meeting one another. During the day, the pilrims navigated through the streets to attend concerts by Catholic musicians such as Franciscan Friar of the Renewal Father Stan Fortuna, hear speakers such as Christopher West, pray in adoration of the Blessed Sacrament at places like the famous Sydney Opera House and receive the sacrament of reconciliation. “One of the biggest things that struck me is that we all speak different languages, have different colors of skin, but we have the same faith,” Chamblee said. Many pilrims had opportunities to take time away from the hustle and bustle of life and really listen to God speak to them. For seminarian Jerry Byrd, a member of St. Louis Parish in Batesville, it brought him peace and more clarity. “I think the Holy Spirit has affirmed what I’m called to,” Byrd said. Byrd, along with other seminarians from the archdiocese and the Lafayette Diocese, encouraged other pilgrims to consider the vocation that God is calling them to in their lives. “I’m very impressed and amazed at the way that this group has embraced the pilgrimage. It all comes down to the fact that the young people are open to the movements of the Holy Spirit,” Byrd said. 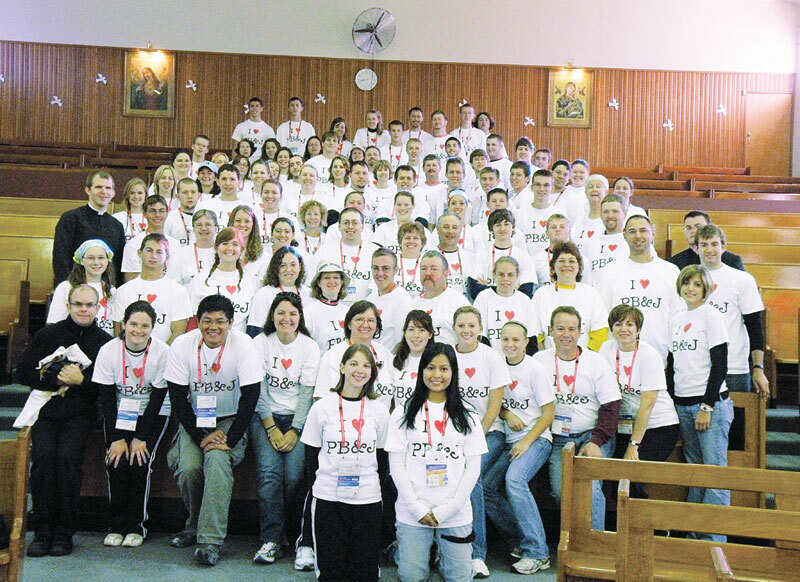 When the archdiocesan pilgrims arrived in Sydney, they were given responsibilities during the days of World Youth Day. World Youth Day leaders asked for volunteers to organize all aspects of the various catechetical sessions. “We felt like we had enough talent in our group to make that happen,” said Kay Scoville, program coordinator for the archdiocesan Office of Youth Ministry. Catechesis plays an important role in each World Youth Day. For three mornings, all registered pilgrims gathered at their assigned site to receive instruction about the Holy Spirit presented by bishops from around the world. Led by Scoville and the archdiocesan director of youth ministry, Father Jonathan Meyer, the archdiocesan pilgrims worked to give participants the best possible pilgrimage experiences through games, prayer, praise and worship, Mass, and assisting the visiting bishops. Multiple pilgrims gave their time and talent in music ministry, liturgical ministries and welcoming approximately 800 pilgrims from other groups at St. Christopher Parish in Panania, a western suburb of Sydney. Archdiocesan pilgrims also learned about sacrifice during the pilgrimage. From the late arrival of their sleeping bags and change in their accommodations to being cold, tired and sleeping outside with 200,000-plus people, they frequently had to adapt and step out of their comfort zones. The theme of the last day of the catechetical sessions was about how the Holy Spirit guides all to be missionaries or, as the Acts of the Apostles says, to be “witnesses” for Christ. Many of the pilgrims said that the Holy Spirit will continue to work in their lives as they return to their schools, jobs and communities. The Holy Spirit: Always at work.